Handmade fashion doll clothes patterns to sew are a great addition for any collector or doll lover to create. They can help to personalize, and bring that much loved doll to life. Many dolls will come with a standard set of clothes; however, if you want your doll to stand out making your own is advised. As in real life your doll will need different clothes for different occasions, and with this stylish five piece set, you have an outfit for every social event. Whether it is an evening dress for them to look glamorous in, or something more casual there is the perfect outfit for your doll. The entire doll industry has developed over the last few years, and more people, no matter of their age want outfits for their dolls that represent their individuality. Often the style of clothing that is bought for your doll is influenced by the latest fashion trends. There is absolutely no excuse why every day your doll cannot look as great as you. Finding the right fashion doll clothes and patterns can take time and research. However, if you check the different patterns on this site you will find some great patterns at even better prices. They do not always have to be expensive and you will find some are even free. Buying sets of clothes is often the most expensive way to dress your doll. So to ensure that your doll has the perfect change of clothes and a large wardrobe, sewing your own outfits is both piratical and fun. There are many places you can find great patterns for doll clothing. If you select the outfits for your childs doll, you may even be able to find identical clothes both doll and child. There is nothing more adorable than a little girl and her doll wearing matching clothes. If the doll is for a friends child they will love the idea of having the same outfit as their best friend. 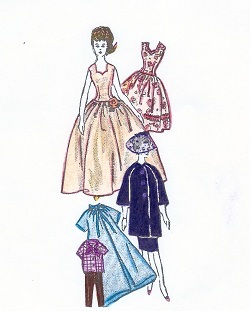 There is a huge amount of thought and detail that goes into the fashion doll clothes patterns. Although there is a large amount of selection for dolls clothes patterns you may find many very expensive. Here you will find no expensive patterns. Most are only $2.99 for entire wardrobes so don't be fooled by the price. All you need to do is know the exact style and look that you are aiming for. As well as the great outfits you will be able to accessories the doll so that they are perfect when she take them out. Whether you are making the dolls clothes for your doll or your children's favorite friend they will in years to come be very collectible. The trend to collect dolls and their clothing has grown to a huge popularity over the years. A great deal of time and effort goes into producing the right clothes for the dolls, so they will stand out and be perfectly dressed. Most store bought fashion doll clothes are created with cheap fabric and poor quality notions. If you take the time to make the best clothes for your doll yourself, you will be happy with your choices and the quality of materials used.